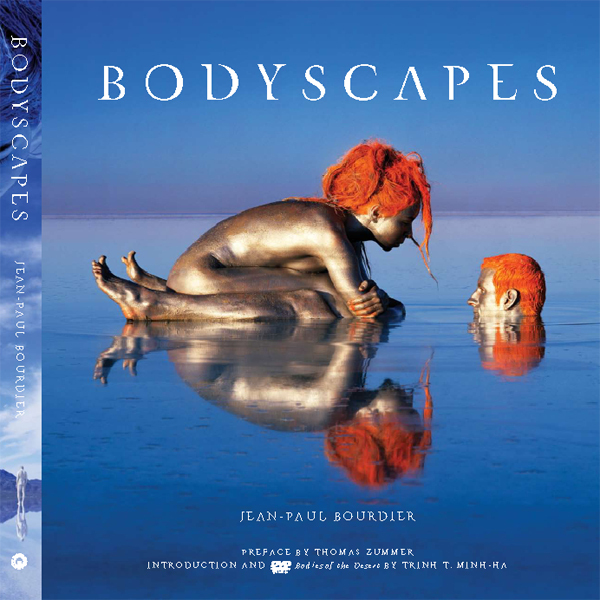 Body Unbound - the latest book by Jean-Paul Bourdier - explores human existence through the physical, the ethereal, and our cultural ancestry. For the first time, the author also reveals the preparation behind his work through architectural sketches, and shares his inspiration through hand-written contemplative verse. As always, Jean-Paul uses no digital enhancement; it is all analog photography. What you see on the page is what was really there. The main body of the book assembles a collection of photographs of painted humans, shot on analog film, without any digital manipulation, in the context of several desert landscapes in the United States. All photographs attempt to bring forward the body as our most intimate tool of perception -- outside of Eros -- of the universe‘s complexity and beauty. Through the careful staging of the models and colors, it is hoped that the viewer may see a poetical performance suggesting the multitude of rapports we can experience with our environment. Further, the work attempts to evoke a most common human longing: the experience of freedom -- which is seen by some as a basis of a host of spiritual practices.